When most teenagers think about finally getting their license, images of freedom pop into their heads. They’ll be free to drive wherever and whenever they feel like hopping into the car and heading out. There’s some truth to that idea (there are no laws stopping you from driving if you are properly licensed), but there’s more to getting your license than you might think. Even if your parents are nice enough to get you your own car, and even if you have saved up enough money to buy a car yourself, you’ll most likely be required to stop at the grocery store to pick up some ingredients for dinner every once in awhile. Also, be prepared to pick up your younger brother or sister from soccer practice. Unfortunately, cars don’t run on air; they need sufficient gas to take you where you need to go. Cars can also require frequent, sometimes expensive, maintenance to keep running properly for years. You’ll need to get your hands on extra money to take care of your car properly. It’s almost inevitable: you’ll lose your keys at some point after you start driving. It’s important to find someone you trust, like a parent, who can hold onto a spare key for you, just in case. You’ll never know when you might need it! This is far more likely to happen than you losing your keys. You will, at many times during your driving years, get stuck in traffic. You might be late to an appointment, or to work, but just know that this happens to everyone. If you’ve got somewhere important to be, leave a few minutes early, just in case. 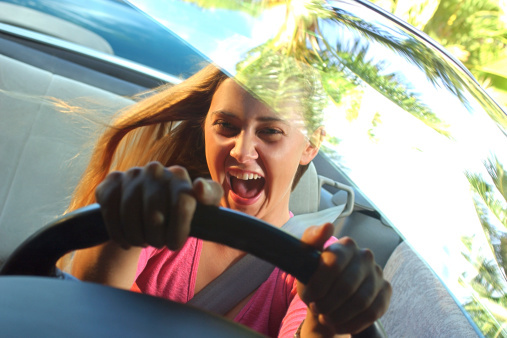 We know that there’s almost nothing we could say to deter you from getting your driver’s license as quickly as possible–and we don’t want to delay the process! Stop in to MVD Express today to take care of all your motor vehicle needs, from obtaining your graduated driver’s license to registering your vehicle. We’ll give you quick and friendly service to get you in, done and on your way in no time at all!